I had to go pick up my new glasses so like everyone who picks up their new glasses, I needed a donut cake. Hey, you console yourself your way, I'll console myself mine. 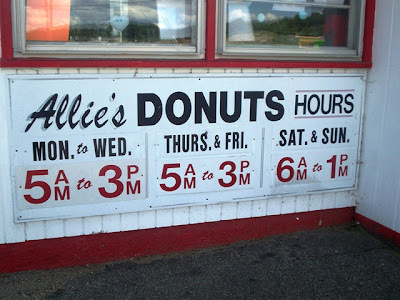 So after I got my new specs (which look great on me), we headed to North Kingston, RI, to go to Allie's Donuts. We've been to Allie's several times (click here to check our review) and are never disappointed. 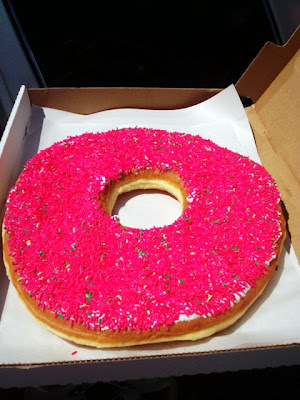 Their donuts are large, terrifically fresh and come in a huge variety of flavors. 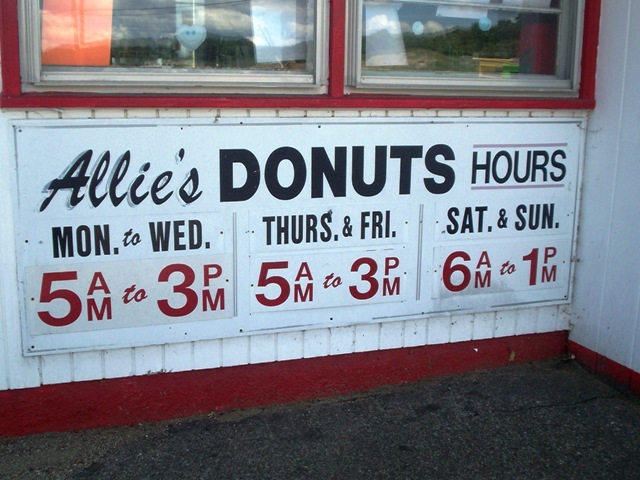 Allie's has made many a Best of Donuts list. They also carry many more goodies like fruit squares, cupcakes, whoopie pies, etc. All are fresh and delicious. Doesn't it look delicious? It is, er, was. It was also huge, 14 inches in diameter. We cut large slices from it and really, it amounted to about a dozen large donuts. Allie's usually has a number of these donut cakes available every day but be warned, it's first come, first served. So get there early if you want to score a "cake". Actually get there early anyway because Allie's closes at 3 p.m. So if you love donuts and, who doesn't, and you want something different than a "cake" cake, get an Allie's donut cake. It's pretty, fun and delicious and kids love it. It's great for a kids' party or after a game. But I just got one because I wanted to. Mmm. P.S. - Boy, could I see that donut case with my new glasses! 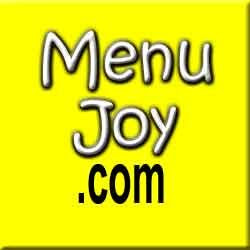 Check out MenuJoy.com for great area restaurant menus.